Schematic representation of a reaction used to attach molecular fuel production catalysts to a visible light-absorbing semiconductor. The modular approach allows ongoing discoveries involving material combinations of light absorber, linking materials and catalysts using new materials as well as promising combinations of existing ones. One focus of our research is integrating light capture conversion technologies with molecular catalysts for energy storage. Unlike traditional heterogeneous approaches to catalysis, with a strong focus on two-dimensional surface morphology, molecular catalysts provide discrete three-dimensional environments for binding substrates, releasing products, and lowering transition-state energies along a reaction coordinate. Thus, in accordance with the Sabatier principle, they can have exceptionally high activity and, perhaps more importantly, selectivity toward complex chemical transformations. 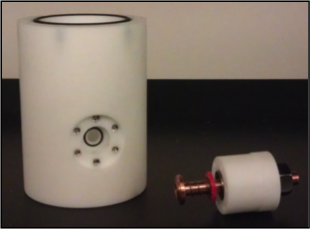 Photo of a customized photoelectrochemical cell equipped with a quartz window. 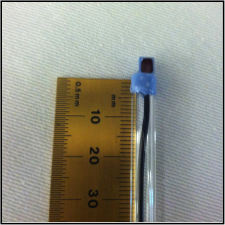 Photo of a 'homebuilt’ working electrode functionalized with a polymeric overcoating. Coupling of one-photon/one-electron photochemical charge separation to multi-electron catalysis are critical issues that will require effective interfaces. The efficiency of the initial light capture and charge separation steps in natural photosynthesis is near unity; but, losses due to inherited metabolic processes and use of intermediate energy carriers reduce the overall energy conversion efficiency to less than a few percent. In principle, human engineered systems may bypass such constraints by having fewer energy transduction steps with improved interfaces. However, this will require strategies to engineer bulk materials and surfaces with enhanced electronic quality, stability and catalytic functionality. Thus, in addition to the development of component materials as described above (e.g. assemblies of energetically matched catalysts and light absorbers to form photoanodes or photocathodes), an important aspect of our research is the discovery of higher order surface morphologies (e.g. second coordination sphere interactions, local environments, and surface treatments that result in effective catalytic operation and/or favorable charge transfer dynamics). As an example, the Moore group has recently reported one of the first examples of a catalytic system composed of a hydrogen generating molecular catalyst attached to a visible light-absorbing semiconductor. In this work, a polymer coating is used to enhance the stability of an underpinning semiconductor against corrosion. The polymer coating also provides attachment points for catalytic units that are stabilized within the confines of the polymer. We speculate that the polymeric support provides additional catalytic durability by offering a protective encapsulating environment, trapping catalytic complexes at redox active sites with abundant coordination sites that favor reformation of surface attached complexes over loss to bulk solution. Comparison of biological and technological systems for (a) solar energy conversion to fuels and (b) the utilization of this stored chemical energy. Both biology and technology use functionally analogous steps, indicated by horizontal arrows, during fuel production and consumption. However, a key difference is the use of molecular recognition and pmf in biology, as compared to the electrical circuits and emf used in technological systems (image taken from: Chem. Soc. Rev. 2009, 38, 25–35). In biological systems, electron motive force (EMF) is coupled with proton motive force (PMF) to store the sun’s energy in chemical bonds (i.e. energy carriers and reducing equivalents such as ATP and NADPH that are used in the Calvin-Benson-Bassham cycle during CO﻿2 reduction). However, current approaches to artificial photosynthesis typically focus solely on using EMF to oxidize water at an anode and create fuel at a cathode. This approach can create inhibitory pH gradients that shut down cell operation or require highly caustic conditions. This problem raises a question as well as an opportunity. Can we turn proton gradients, which are a problem for human engineered systems, into an advantage by linking proton pumps to fuel synthesis? Using bio-inspired or bio-derived hybrid structures, this approach could tap into the energy stored as PMF in pH gradients. The challenge is to combine engineered biological parts with new materials and technologies to create bio-artificial photosynthetic devices. Approaches to achieve this grand challenge include collaborative efforts at the nexus of materials science, biology and computational chemistry. The Center for Applied Structural Discovery (CASD) at Arizona State University’s (ASU) Biodesign Institute unites a team of complementary research professionals from a wide range of disciplines, including biology, chemistry, physics and engineering, to develop and apply ground-breaking technologies and methodologies to accelerate the rate at which we discover the structure and associated function of biomolecules. Breakthrough knowledge will accelerate progress on the path to technical innovations that improve human health and provide plentiful clean energy and food for future generations. The intricate orchestration of biological activity on our planet is enabled by nature’s remarkable nanotechnology, composed of molecular machines called proteins. Proteins carry out all of the essential tasks critical for survival, including normal metabolism and tissue repair, the response of our immune system to pathogens, and in plants and algae, the ability to capture and use energy from sunlight to produce the oxygen we breathe and the food we eat. Understanding how proteins perform their remarkable tasks requires a multi-faceted understanding of their structure, dynamics, and the physical and chemical processes that occur at the molecular and atomic scale. The emergence of new generations of state-of-the-art technologies that probe these processes promise hope that science and technology will emerge with a revolutionary understanding that enables building of human engineered systems that mimic and improve on biology in order to solve pressing global challenges in healthcare and energy conversion.